Sandor Clegane & Sansa Stark. . HD Wallpaper and background images in the A Song of Ice and feuer club tagged: a song of ice and fire asoiaf sandor clegane the hound sansa stark. This A Song of Ice and feuer wallpaper might contain porträt, kopfbild, nahaufnahme, portrait, headshot, and kopfschuss. Beautiful ! 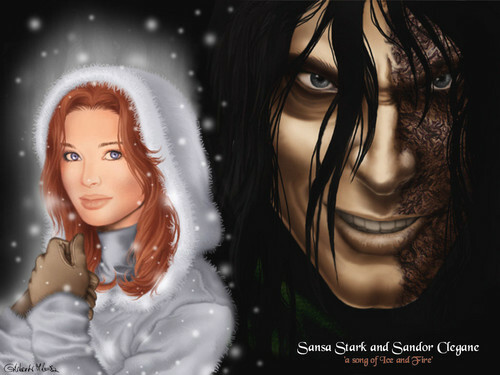 I love how you pictured Sandor's gaze and the contrast with the sweet Sansa.